Everyone loves a good old fashioned barbecue. The easy conviviality of a family backyard picnic. The smoky summer scent of charred goodies grilling. Lemonade chilling. Badminton birdies sailing. The crack of croquet balls. The last pink of June daylight. Punching lids on firefly jars. It's the stuff of a midsummer night's dream. But if you need to be on a gluten-free diet- or if you happen to be vegan- or allergic to wheat- barbecues can be a tad less than convivial. Those mysterious grilling sauces and marinades (so often containing wheat-laced soy sauce). Those gluten-rich fluffy hot dog buns. All those meaty manly burgers and boiled egg dotted salads. What's a gluten-free vegan to do? Don't worry, Babycakes. I've got your back. How about a light and summery quinoa salad with grilled corn, fresh parsley, lemon, and chopped mint topped with smoky grilled veggies- velvety red onion, sliced zucchini, charred bell peppers, portobello mushrooms, tender-crisp asparagus and butter soft eggplant? 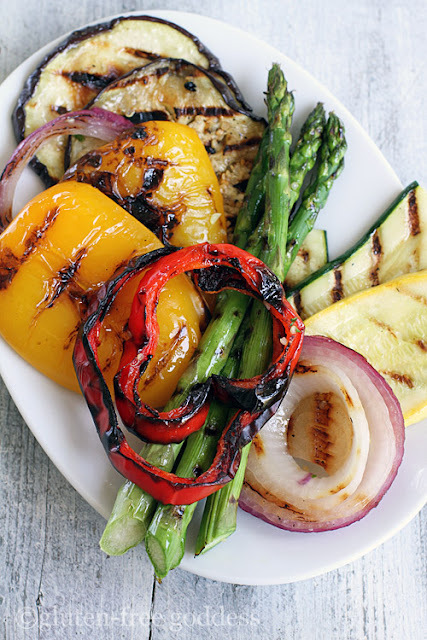 Grilled vegetables are the jewels of summer. They're show stoppers, really, in their gorgeous rainbow colors. No one will feel cheated or deprived eating a bowl of these beautiful smoky-sweet veggies with lemon-infused quinoa. Serve a side of hummus tahini as a cool and creamy condiment. By Karina Allrich June 2012. 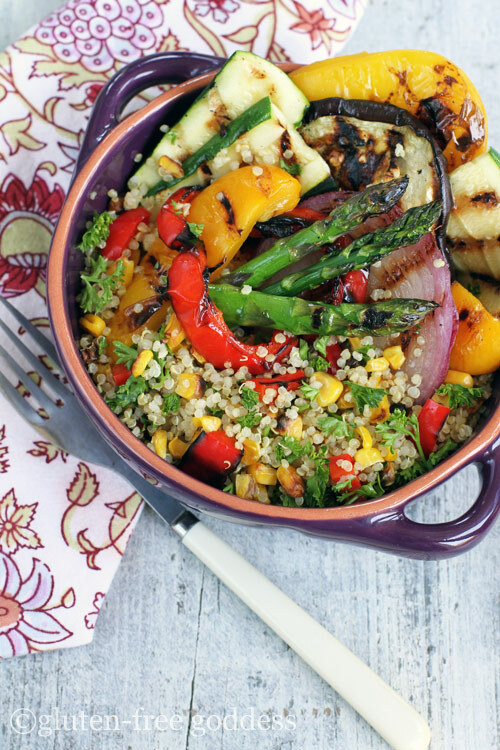 Vegans and omnivores alike will love this summery quinoa dish with smoky grilled veggies. The easiest way to grill marinated veggies is to use a grill basket. But foil also works (and solves the whole cross-contamination issue for those eating gluten-free). If you don't have an outdoor grill, you can grill your veggies using a cast iron grill pan. In a large bowl combine the the onion, bell peppers, zucchini, yellow squash, eggplant, portobello mushrooms, and asparagus. Drizzle with olive oil and white balsamic vinegar. Add the garlic, and thyme. Season with sea salt and ground pepper, to taste. Gently toss to coat. Cover and marinate for one hour. Grill the ears of corn separately on a rear rack, away from direct flame. The husks will get a bit blackened and smoky. This adds so much flavor. Rotate them every five minutes or so. After 10-20 minutes, when the corn is tender, remove and set aside to cool. Strip off the husks and carefully slice the kernels off the cob. Set aside. Meanwhile, place the veggies in a grill basket, or spread out the veggies on a large sheet of foil. Add a top sheet, crimp the edges of the sheets together to make a packet. Place on the hot grill and cook until tender crisp, about 15-25 minutes, depending upon the size of your grill. Remove the veggie basket/packet to a large platter or cutting board, and set aside. Place the cooked quinoa in a large serving bowl. Add the grilled corn, chopped fresh parsley, and mint. Drizzle with extra virgin olive oil and lemon juice. Season to taste with sea salt and ground pepper. Toss to coat. To serve, you can either slice the grilled veggies and add them to the quinoa as a salad, or serve the simple quinoa-corn salad with big beautiful pieces of grilled veggies on the side. Hummus is a lovely condiment with grilled veggies. Try this tasty roasted red pepper hummus. Note: Before cooking quinoa, rinse the quinoa thoroughly in a fine sieve.